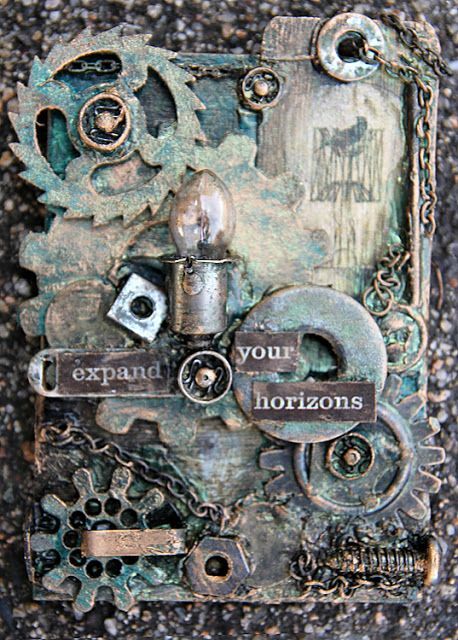 Have I told you how excited I am about the new metallic copper products in the 2016-17 Annual Catalogue? 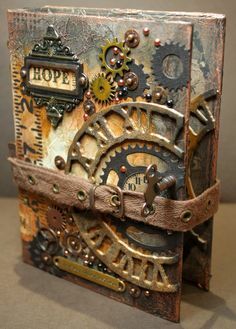 I love the warm look of copper, but it's also great for Steampunk design which, if you've been following my blog for any time, you'll know that I love. I would like to be able to do more of it. The only product I've been able to get so far is the Affectionately Yours Specialty Designer Series Paper*, but I do have some contraband copper embossing powder, which I am using until I can get my hands on the Copper Stampin' Emboss Powder*, Stampin' Up! 's product, which I already know is far superior to the contraband stuff, having experienced them both. Aren't these interesting designs? You can see why I have the need for copper embossing powder though. 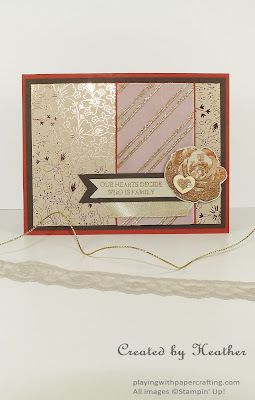 As usual, it was hard to get a photo that showed the shine of the copper embossed pieces, but the design paper, the diagonal stripes on vellum, the sentiment, the rose, and the little heart all gleam with a warm copper light. 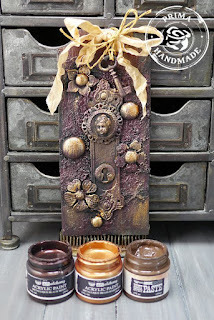 Because my contraband copper is really dark and grainy (not at all like the lighter, finer version that I will get when I can order the Copper Stampin' Emboss Powder from Stampin' Up! ), I added some Gold Stampin' Emboss powder to it. This lightened it and took care of some of the grainy texture problems. 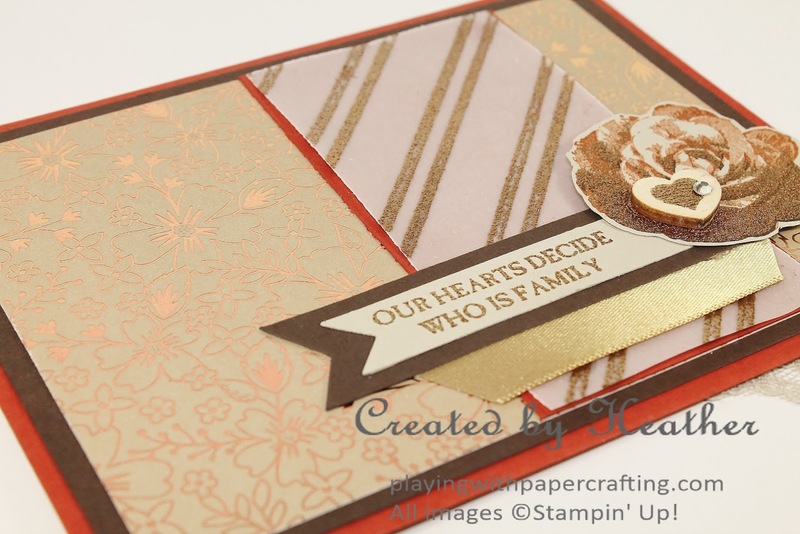 I created the embossed stripes on the vellum panel using the retiring Stylish Stripes Embossing Folder. I inked up the inside of the embossing folder on the side with the raised narrow stripes with Versamark Ink. I placed the vellum inside and closed the folder, then rubbed it with my hand to be sure the ink was properly transferred to the vellum. I should mention that before I did this I rubbed the vellum with an Embossing Buddy, to ensure that the embossing powder stayed only on the parts to which I had applied the Versamark Ink. I poured the embossing powder over it and lightly tapped off the excess, then heat set it with the Heat Tool. 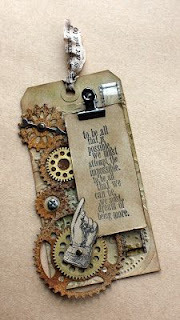 The sentiment and image are from the Picture Perfect stamp set stamped on Sahara Sand cardstock. 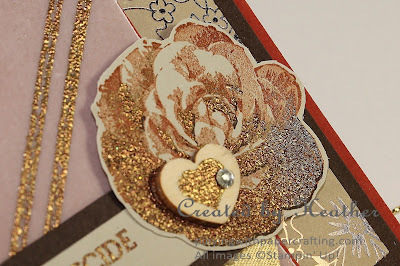 For the 3 step stamping rose, I stamped the first of the three parts of the image in Cajun Craze, stamped off once before stamping it on my paper. The second part of image was in full strength Cajun Craze. The third part of the image, I actually stamped first in Early Espresso. This dark image was so much easier to see to line up the other two properly. 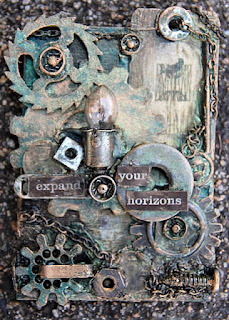 At the end, I stamped this part of the image again, after making sure the other inks were dry, using Versamark and added my homemade concoction of Copper Embossing Powder, and heat set it to get the image you see on the card. It had to be fussy cut, but it's a very easy shape to do that. You can see it a little better in the photo below. Thanks for dropping by today, and I hope you'll head over to As You See It Challenges this weekend and get a little crafting in, with all your busy plans. You have two weeks to do the challenge.